Ok – so we were immediately obsessed with Keera Job’s Grandale collection when it first arrived on the scene. The soft, yet vibrant colors combined with the mix of florals with geometric patterns – yep, we HAD to make a baby quilt. And what perfect pattern to use, but our Lottie’s Squares Quilt Pattern. We love how Lottie’s Squares is so versatile! We made a Red, White, and Blue version, a Blue and White version, a Woodlands Creatures version, and we definitely see more versions in our future! The block for Lottie’s Squares is a 4” square framed on 2 sides with 1” solid sashes. We lay out these blocks in such a way that creates a “sprinkled” look. And there are more layout options available for this block! We show you how to lay them out in our quilt pattern. In previous quilts we opted to press our seams open, but with this quilt, we discovered a great nesting technique. We pressed the sash seams toward the 4” square and then pressed the blocks when they are lined up in their rows, in alternating directions. When we lined our rows ups, they nested beautifully. All the pressing details are available in our Lottie’s Squares Quilt Pattern. For quilting, we kept it simple. We stabilized the quilt by sewing around all the blocks in their “ditches.” We then added just a touch more quilting by quilting ¼” on both sides of the ditch stitches. And for the backing, we opted for a soft Printemps in Plaid from Art Gallery Fabrics. We love the feel of Art Gallery’s fabrics and they make perfectly soft backings for our quilts. We used the same plaid for the binding and the binding gives the quilt a nice, soft finish. This sweet baby quilt is available for sale in our shop. It measures 40” x 50” and is the perfect size for a crib or for tummy time or for snuggling. We have an extra 10” Square pack of Grandale fabric listed in our shop as well. It’s the perfect amount of fabric for a baby quilt. Pair it with your favorite off-white cream fabric and you too, can make your own version of Lottie’s Squares! Well, it’s on to a new project! ***Hint*** New Quilt Pattern! Want to stay in touch and tell us what you’re working on? Join our email list! 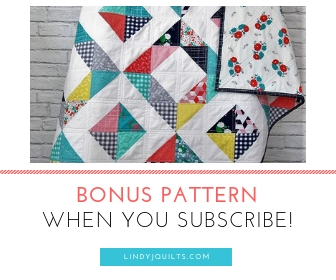 Subscribe and you’ll get all kinds of Lindy J Quilts quilting goodness!